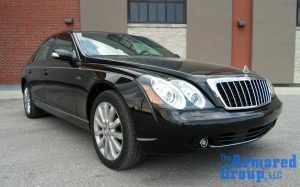 As you can imagine, bullet proof automobiles have prices ranging from the high tens to hundreds of thousands of dollars! Because there are differing protection levels due to the large variety of ammunition and the accompanying damage it sustains, the quality of armored vehicle protection is impacted by that range. While The Armored Group’s (TAG) output is always top-notch, what goes behind the scenes to ensure quality? There are a variety of organizations authorized by national and worldwide governing institutions that oversee testing and certification. TAG proudly boasts their ISO 9001 certification in addition to blast certification of VPAM – BRV 2009 and VR7 Ballistic ERV 2010 for both the Toyota Land Cruiser and Toyota Hilux. The Armored Group recently completed a seven-week renovation of a Maybach 57S, an armored vehicle built especially for one of our high-profile clients. Our innovative practices have allowed us to debut our newest invention, TAGLight. To make a vehicle not look obviously armored, we have created a composite of ballistic steel to be 63 percent lighter than thick steel plating. How can a company like TAG be allowed to create and implement inventions for their industry? The answer is simple: certifications. ISO represents the International Organization for Standardization, which was founded in 1947 to assist in international trade by providing the specifications necessary for global standards for three categories: products, services, and good practices. 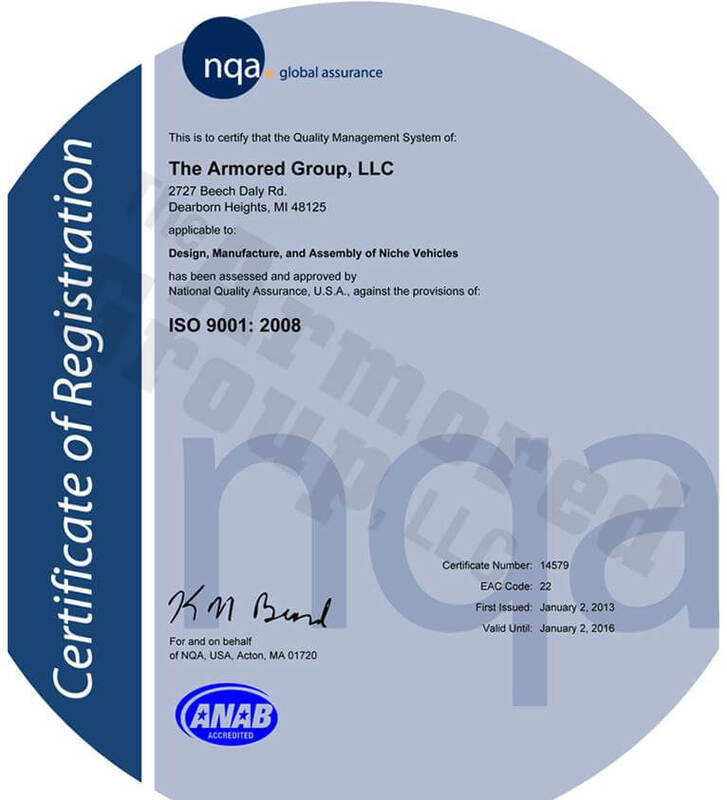 The ISO 9001:2008 certification, according to ISO , is provided to organizations and businesses that meet the standards for quality management system in two distinct categories: (a) consistent production of consumer and industry expectations as well as meeting requirements for both statutes and regulations; and (b) meets and exceeds consumer expectations by offering more efficient products or practices than current methods. Based on their explanation, TAG has met those requirements because they have several projects lined up post-Maybach production, and the Maybach effectively rolled out their newest product, TAGLight. Some of TAG’s vehicles, such as the Rapid Deployment Vehicles (RDVs), are mandated by the testing agency known as the National Tactical Officers Association (NTOA). Organizations most likely to use NTOA tested vehicles include police departments, sheriff’s offices and other tactical associations. The NTOA’s main mission is split between empowering and informing those employed by law enforcement agencies and creating an area of discussion to assist in tactical development and exchange of information. This applies to TAG since we work closely with law enforcement agencies on both a local and national level, whether it is the police department or various government military operations. On the whole, certifications mean that a company consistently desires to prove themselves worthy of their consumers. This not only displays transparent honesty but also exhibits a hungry need to set a business apart from the rest of the industry. Certifications contribute to wider networks, and organizations can therefore be exposed to a larger business audience. Other TAG certifications are available here. 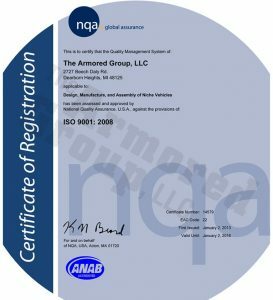 The Armored Group is a worldwide operating company with three manufacturing locations (two in North America and one in the Middle East). Our company has exceptional sales associates who are thoroughly knowledgeable about our products and practices for all of your armored vehicle needs. Take a look at our selection, and then call us at 855-TAG-SAFE (855-824-7233) about making one yours today! ISO. “ISO 9001:2008: Quality Management Systems – Requirements: Abstract.” Retrieved January 13, 2014 from http://www.iso.org/iso/home/store/catalogue_tc/catalogue_detail.htm?csnumber=46486. National Tactical Officers Association. “Our Mission.” Retrieved January 13, 2014 from http://ntoa.org/site/about/our-mission.html.